Ephesus or Efes was the capital of Roman Asia Minor, and today it is the most impressive Classical site in Europe. 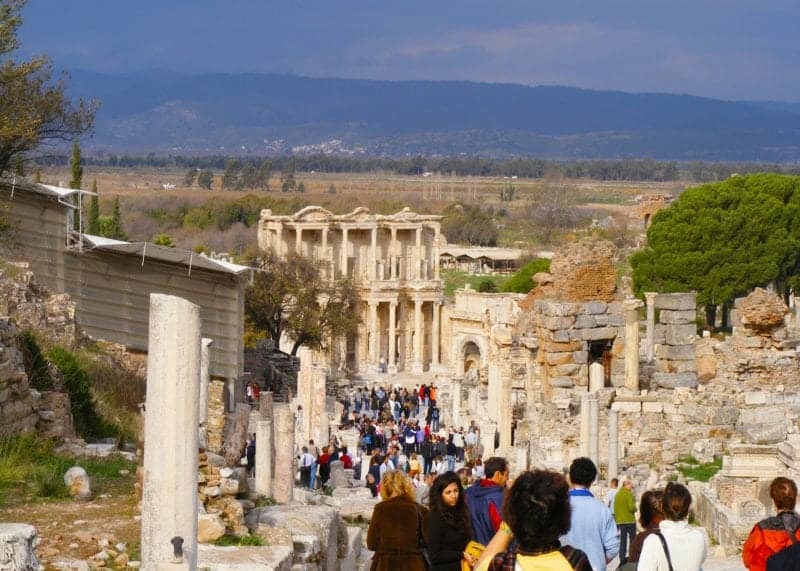 With this guide to Ephesus, you will be able to see all the major sites and enjoy them all with our best tips for visiting Ephesus. Ephesus is an ancient city founded on the coast of what has become modern Turkey in around 3000 B.C. On the Royal Route of trade to the east and a prominent religious centre for both Pagan and Christian religions it is one of the greatest cities in history. This is an absolutely huge and impressive site and it can be a bit overwhelming. We took a cruise to Izmir which was amazing and then took a private tour of the site with 6 others from the cruise ship. The tour guide was amazing and he started our tour at the Lower Gate which is usually the exit area for the tour buses, so we managed to see most of the site without being overwhelmed with other tourists. There are two entrance gates to Ephesus the Lower Gate which is the one we took is the nearest to Selcuk village and has a huge parking lot available for the tour buses and taxis and those that drive to the site. The Upper Gate is usually where the tourist buses drop of the visitors and then move to park by the Lower Gate. In starting at the Lower Gate this was how we managed to avoid the huge crowds. Given that it is a sort of uphill climb the Lower Gate is still an easy walk particularly if you arrive early in the day and even later in the day. There are paid audio guides available at both entrances and they are available in many languages. It was claimed by ancient writers that Ephesus was founded by the Amazons under their Queen Hippolyta at that time the location was right on the Aegean Sea around the 3rd to the 5th millennia. The initial location of Ephesus was a river bend that eventually became a full harbour near the mouth of the Kayster (Cayster) River. The river frequently silted up over the years and became removed by around 5-6 kilometres from the sea. The silting did, however, create an incredibly fertile valley for current day farming. 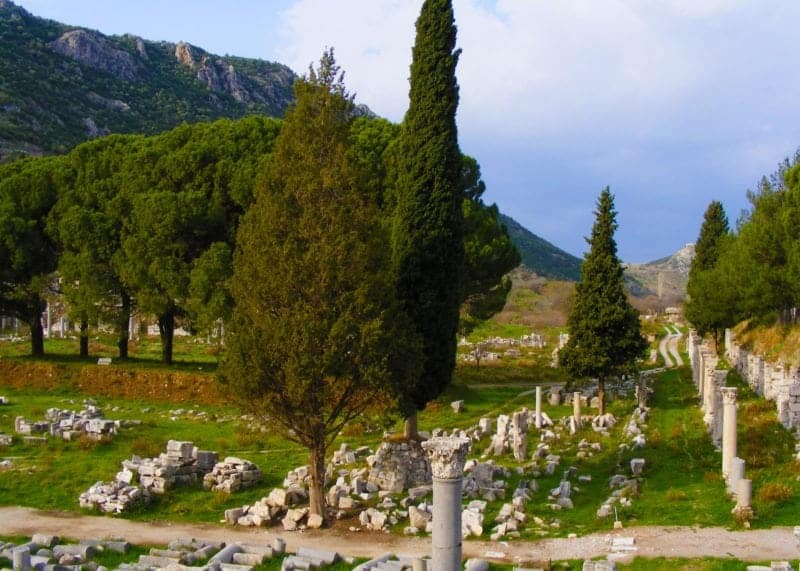 Walking the marble road of Ephesus you are literally walking in the footsteps of Antony, Cleopatra and Caesar. 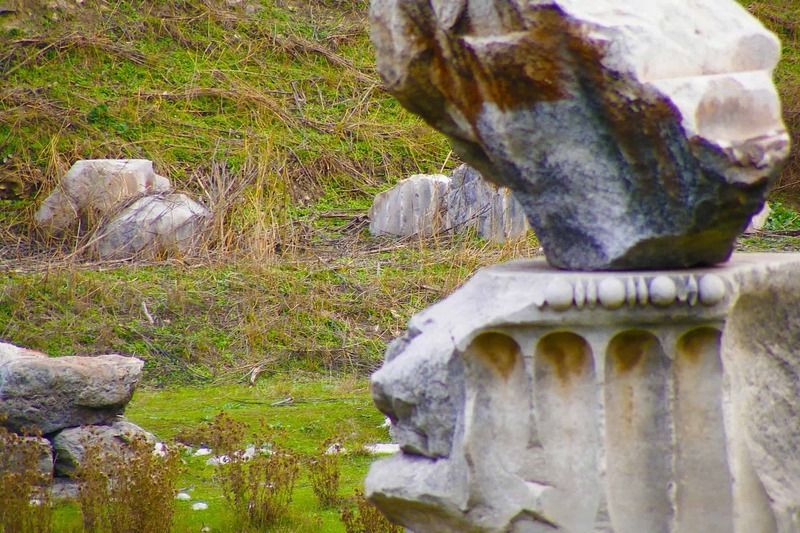 On your way to the site of Ephesus, you will pass the Temple of Artemis. These days this is not much more than a total ruin but still, it used to be one of the 7 Wonders of the World. This was believed to have been re-built over 7 times according to Pliny. Originally the Mother Goddess (Kybele) cult was assimilated with the newly arrived Greeks who made up a new cult with their goddess Artemis. A temple was built by Croesus which was completed by 430 B.C. However, the magnificent building was burnt down by a lunatic who wanted to be famous, the temple burned the night Alexander the Great was born. The site is still visited to this day but much of the materials that went into the building of the great temple have been used in other monuments which are visible from the site. Ephesus became a UNESCO World Heritage site in 2015 and you can learn more about these World Heritage Sites here on the blog Anything-Everywhere. 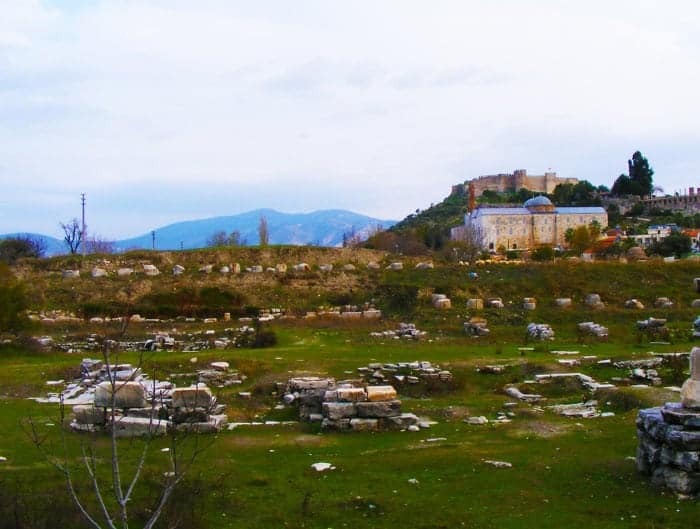 Around 10 BC Androclos was searching for a new location in which to site the city of Ephesus. Because of the man-made harbour and the flow of the river, backwashes caused the harbour to frequently silt up. It was written the Emperor Hadrian cleared the harbour and when this was finished Ephesus was in a location that justified a great seaport. The city sat at the convergence of three land routes, going East, North East and North with a shipping lane from the north. It became a magnet for citizens from all over the known world. As its height, Ephesus was calculated to have around 250,000 citizens which put in around the 4th largest City in the World. It became over time a magnificent City with its Marble Road, which was known as the Sacred Way and must have been a splendid place to live. Archaeologists have been excavating Ephesus for the last 140 years when a search for Artemis Temple was undertaken. The site spreads over approximately 12 kilometres only a 10th of which has currently been excavated. The Roman influence at Ephesus is the most apparent. With its Roman Baths, public W.C.’s with a full sewer system, the Library of Celsus, Basilica, and Odeon that seated 1400 spectators and a great theatre which seated 25,000 the ruins at Ephesus are an incredible step back in time. Walk the Sacred Way that Antony and Cleopatra strode on. The white marble road has been pieced back together over the past 100 years and remains a stunning reminder of the glory of this ancient site. 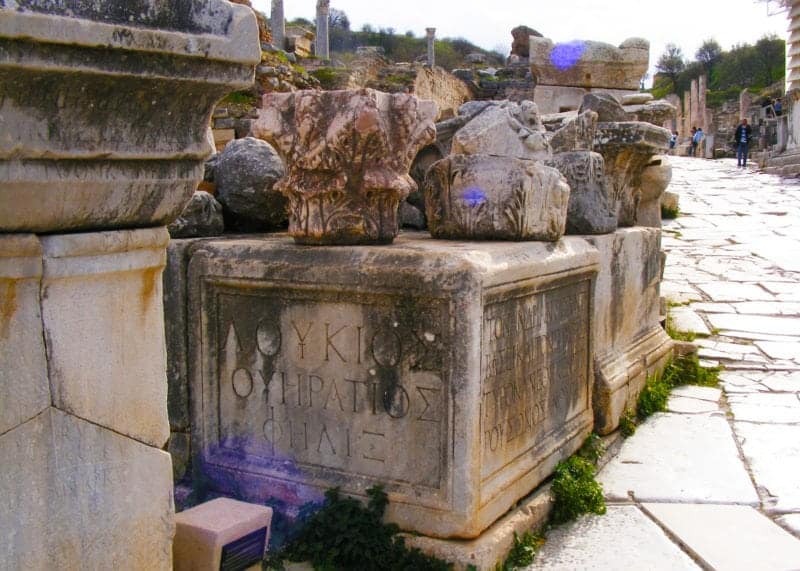 The Arkadiane was built to impress visitors to the great city of Ephesus. A collonaded marble road that connected the harbour and the theatre. It was built during the Hellenistic period and was a 530m long street that had 50 streetlights, shops and galleries. The Arcadian Way was used as a ceremony road. It links the famous Royal Route to the sea and runs around 500 metres with galleries and shops either side the full length of the road. The Marble road is where Cleopatra and Antony walked the length of Ephesus. It leads to Hadrian’s Gate and connects the Celsus Library to the theatre. It is on the Marble Road that you will see what is believed to be the oldest advertisement in history. The distinct imprint of a foot leads the way to a private house which was a hidden brothel. There is a cross, a woman, a heart, a library and a and a hole interesting ad no? There are lots of different interpretations of these images but you can pretty much guess at the meanings. 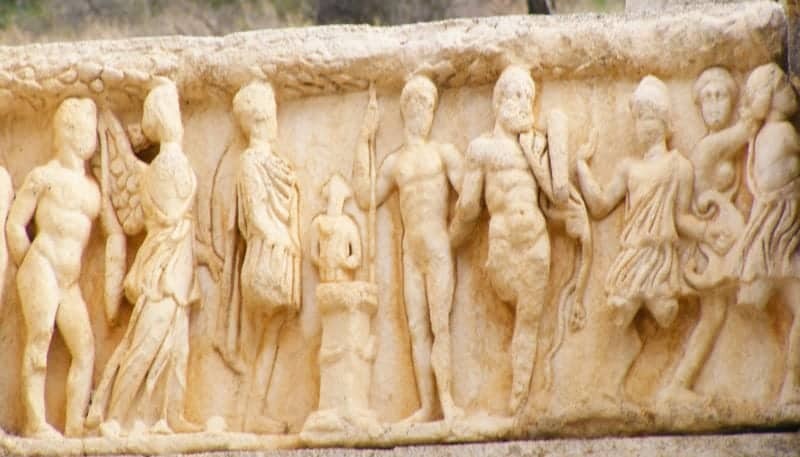 This is the most iconic photographic image taken at Ephesus and the one most associated with Turkey. The Celsus Library was the third largest library in the ancient world, and it held up to 15.000 scrolls. The library building itself sits on top of Celsus’s grave or sarcophagus which lays in the crypt below the building. The statues which can be seen in the various niches at the front of the library symbolize the “virtues” of Celsus and they are Valor, Wisdom, Knowledge, and Intelligence. The Library of Celsus was cunningly built and designed to look far grander than its narrow lot would allow for. The double walls of the library were built to ensure good temperature control to preserve the scrolls. The walls and floors were faced with coloured marble and the lavish use of decorative wall friezes and ora. To visit the Terraced houses you do have to pay an extra entry fee. The houses are kept protected underneath a tented roof and many visitors to the site miss them as they are not on most regular tours. 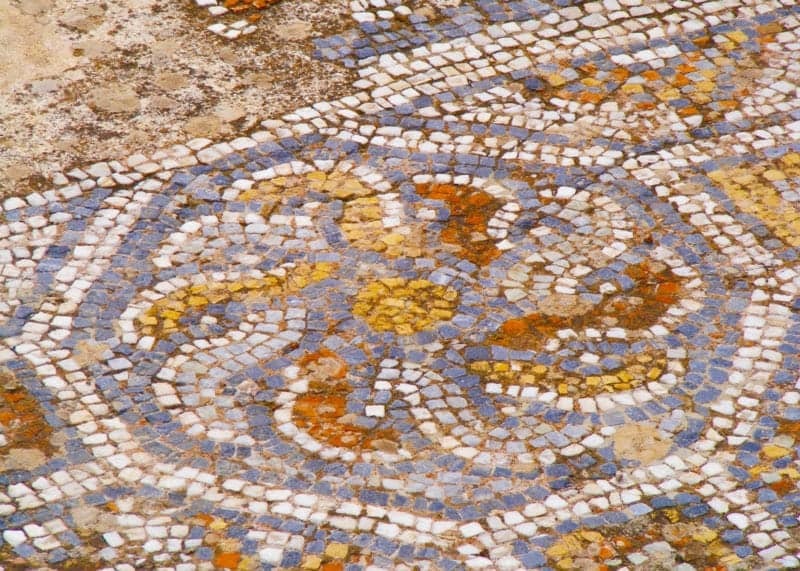 With their intricate mosaic floors that are as bright today as when they were first installed. Seat yourself in the Odeon or Great Theatre and just feel the presence of those ancient people. Imagine looking out over to the Aegean Sea and in your view was one of the most glorious sites in the entire ancient world. These houses were built during the Roman Period, with the oldest one dating back to the 1C BC. The houses had hot and cold water and even a heating system using clay pipes. There are 6 houses that are built over 3 terraces and excavations started on them around 1961. When Christianity became the official religion of Rome this building was turned into a basilica and it was the first church dedicated to the Virgin Mary. Within the Church, you will see the best-preserved baptistry in Asia Minor. 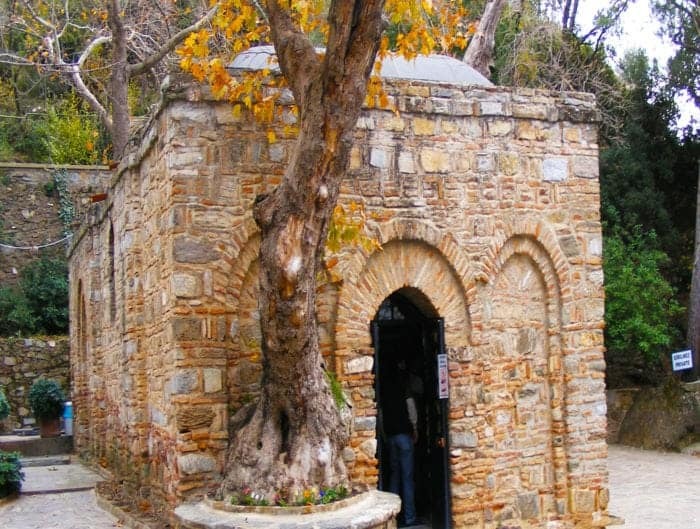 Up in the mountains near Ephesus, you can also visit the ancient site of what is considered the Virgin Mary’s home. Turkey is a mecca for shopping, the bazaars and souks are irresistible. I came home with gorgeous leather jackets, spices and a ton of stuff. If you really want to learn what to buy when you visit Turkey I suggest you have a read of Lindsay’s (at Carpe Diem Our Way) great article on What to buy in Turkey. Turkey is a place that my husband and I absolutely loved and we cannot wait to get back there again. If you love Turkey and want to find some fabulous places to visit outside of Istanbul look no further than Melissa’s article on 16 Wonderful Day Trips from Istanbul. I want to explore every single one. I have had Cappadocia and a balloon ride on my bucket list of travel for years now Susan the GenX Traveller managed to cram in this and a host of other amazing activities on her visit to Cappadocia 24 hours, caves, fairy chimneys, and hot air balloons.